No evidence has been found of the sacred entrance in the front of the Great Sphinx described by Iamblichus. Nor has an underground passage been discovered leading from the Sphinx to the Great Pyramid, which lies some six hundred meters to the northwest. Although seismograph measurements made in 1991 indicate anomalies or cavities situated deep in the bedrock between the paws of the Sphinx and along its sides, further investigations are needed to determine whether these are an indication of the presence of underground chambers. Nevertheless, it should be kept in mind that the lower part of the Sphinx was usually inaccessible; it was covered by sand during most of the dynastic Egyptian era. Unlike the pyramids, which were assembled from stone blocks, the Sphinx’s 65-foot-high, 240-foot-long form was carved from a natural limestone knoll, sculpted in such a way that the lower half of its body lay entirely below ground level in an excavated cavity. If not kept cleared, this cavity fills up with windblown sand in a matter of decades, leaving only the Sphinx's head exposed. Since it is a rather difficult task to clear away this sand, it was not done frequently. For example, John Anthony West estimates that the Sphinx remained unexcavated for at least three-fourths of the 2,400-year period between the time of Chephren and the Ptolemies (2700 B.C.E. to 300 B.C.E.). Consequently, in order to conduct an uninterrupted sequence of initiations, the magi would have had to carry out their ceremonies in chambers situated elsewhere in the pyramid complex and to lead the blindfolded novice to believe that he had actually entered through the Great Sphinx. Entry through the Great Sphinx, whether real or imagined, would have been very important for reasons of its symbolism. Both in ancient Egypt and in Mesopotamia, sphinx statues were placed at the entrances to temples and in front of city gates, where they stood as guards to ward off unwanted intruders. In a similar fashion, the Giza Sphinx guarding the entrance to the initiation chambers of the Temple of the Mysteries would have served as the gatekeeper, protecting the inner sanctum where the ancient knowledge was kept. In fact, from its ancient Greek name, sphinctre, we have inherited the word sphincter, which signifies a constriction that controls entrance (or exit) through a passage. There is a tradition or theory that the Sphinx is a great complex hieroglyph or a book in stone, which contains the whole totality of ancient knowledge, and reveals itself to the man who can read this strange cipher which is embodied in the forms, correlations and measurements of the different parts of the Sphinx. This is the famous riddle of the Sphinx, which from the most ancient times so many wise men have attempted to solve. A clue to the meaning of the sphinx cipher may be found in astrology. In its complete representation, the sphinx is composed of the hindquarters of a bull, the forequarters of a lion, the wings of an eagle, and the head of a man. These correspond with the four fixed signs of the zodiac: Taurus (the Bull), Leo (the Lion), Scorpio (the Scorpion), and Aquarius (the Water Bearer), the Eagle being traditionally considered an alternate symbol for Scorpio. As discussed in chapter 9, the twelve signs of the zodiac are found to encode a metaphysics describing how the first particle of matter came into being, the same creation science portrayed in the myths of Atum and Osiris. These four fixed signs depict key stages in this matter-creation process: Taurus, the source of vital energy; Leo, the critical fluctuation; Scorpio, hierarchical restructuring; and Aquarius, the new state of order. The Great Sphinx at Giza, which is composed of the body of a lion and the head of a man, presents just two of these concepts. Leo symbolically expresses the concept of the critical pulse of electric potential that has emerged from the ether and is about to disrupt the ether’s uniform symmetry, while Aquarius represents the condition of the ether after its symmetry has been broken, when this critical fluctuation has grown into a macroscopic wave pattern--the primordial subatomic particle. Like Horus in the myth of Osiris, Leo is the warrior prince who ultimately resurrects the ordered regime--Aquarius. It is significant that the Sphinx’s lower, lion half should correspond with the concept of the emerging fluctuation and that its upper, human half should correspond with the notion of the fully materialized primordial particle. The lower half of the Sphinx represents the spirit world, the realm of implicit order, the subquantum domain, while its upper half represents the world of the living, the realm of explicit order, the physical world. In the story of Osiris, this emergent state of physical order is portrayed by Horus, who is the ruler of the royal kingdom. So it is not surprising to find the head of the Sphinx adorned with royal symbols, such as the trapezoid-shaped Nemis Crown, a white magical wig worn only by royalty. The uraeus snake, the royal symbol of wisdom and transcendent action, also appears at its brow, although much of the uraeus was defaced in the eighteenth century when the Mamluks used the head as an artillery target. "A remarkable innovative creative work from one of our most brilliant and original thinkers. Genesis of the Cosmos reads on many levels at once to delight, inform, and surely challenge us." "As an inveterate synthesizer for an intelligent public, I am always delighted to come across scientific thinkers who go beyond a single discipline--who explore and explain how their model may account for a wide range of phenomena. Paul LaViolette is such a thinker." ". . . a courageous examination of scientific theory and alternative history. . . . a wide-ranging and fascinating intellectual excusion. . ."
". . . filled with theories and stories and myths and equations that may boggle the mind, so read slowly and carefully, because this isn't New Age stuff. 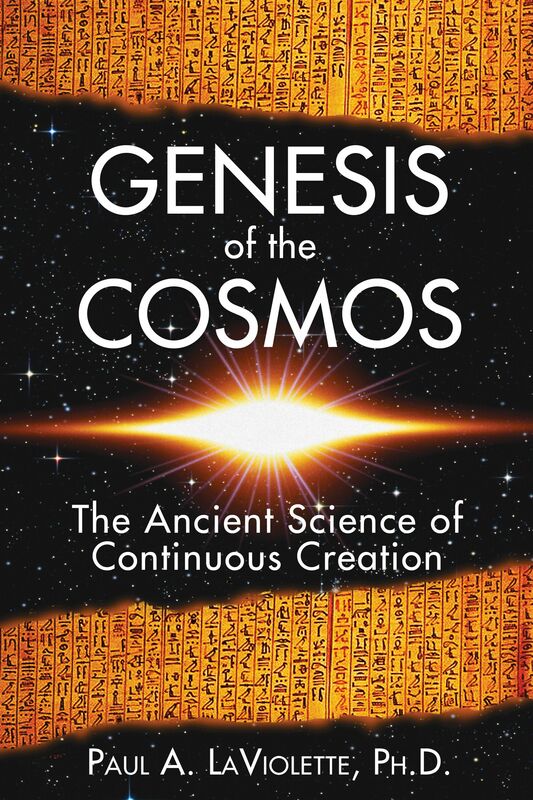 In fact, Genesis of the Cosmos is pure science with a touch of speculative theory, and a creative and original twist of looking back into our past to discover our future." "Both ancient myth and modern physics get the detailed treatment in this creative yet highly technical and strongly researched book." ". . . no-holds-barred rejection of every significant tenet of twentieth century relativistic cosmology . . . no better place to begin."